Fiddleheads ferns are the most whimsical of spring’s bounty. Very few cooks are not captivated by their shape, which is among the most mesmerizing in nature — think of the nautilus shell, a hurricane, or the Milky Way. But you need to know that a fiddlehead is a shape, not a species. A great many ferns begin each year by sending up fiddleheads, but only two are generally eaten in this country: The ostrich fern in the East (and, oddly, British Columbia), and the lady fern in the West. If you gather your own, you need to know the difference between these edible ferns and their inedible cousins, like, say, the sword fern. The good news is you can buy them. Many markets sell fiddleheads, such as Whole Foods and Nugget here in NorCal, and you can sometimes find them at good farmer’s markets. You can also buy fiddleheads online. 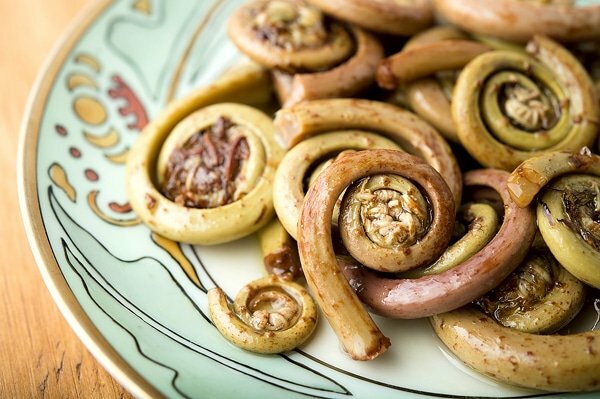 Once you have your fiddleheads, what to do with them? My friend Langdon Cook has a bunch of great recipes here, and I’ve cooked them with morels and ramps, and with freshly caught trout. Fiddleheads need to be cooked, at least for a few minutes, and are great sauteed, stir-fried, batter fried, steamed, blanched, baked in casseroles, grilled… you get the point. I always start by blanching my fiddeheads when I get them home. Boil in a large pot of salty water for 2 minutes, then plunge them into a bowl of ice water to cool. Cook briefly from there. Fiddleheads will last about a week in the fridge, lightly wrapped in paper towels, which will turn brown for some reason while they’re in contact with the ferns. After a week, however, they get icky and slimy. Pickled fiddleheads are the best way to preserve them, to my mind. You can of course do a regular vinegar pickle, but I prefer the old-style brine pickle: I like the tang that lacto-fermentation adds to fiddleheads. Lacto-wha? Don’t be scared. It’s just a brine pickle. All you need to know is that you need the salt-to-water ratio that I give you in the recipe below, and you want to ferment below 75°F — above that temperature, weird things can happen. Let the pickles ferment for a week or two, and you are good to go. 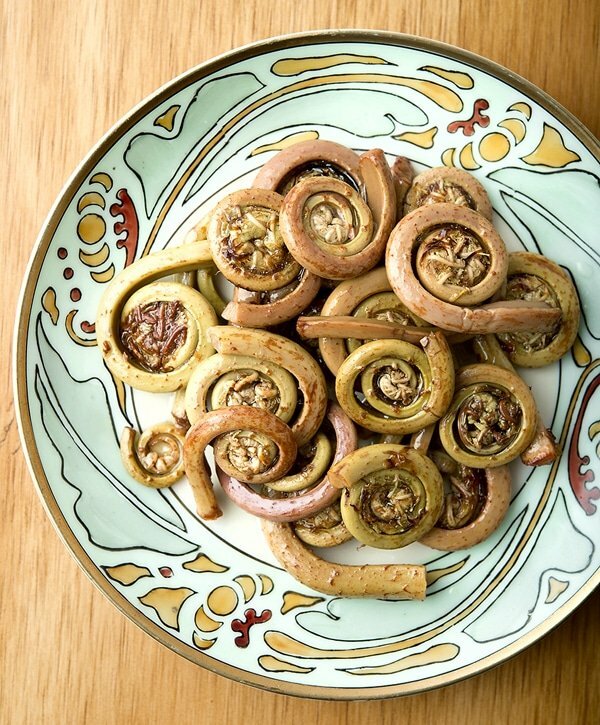 What to do with your pickled fiddleheads? I just eat them, mostly with charcuterie like fromage de tete. Langdon adds them to a Sichuan stir fry, and I bet they’d be good in an omelet or Spanish tortilla. They last a year in the fridge, so you’ll have plenty of time to experiment. This recipe can be scaled up or down, and you will notice not everything is exact; pickling is like that because one fiddlehead might be twice as large as another. Also, I like these seasonings with the fiddleheads, but feel free to use your own. The only thing you shouldn't mess with is the salt-to-water ratio. This protects the vegetables from bad bacteria. 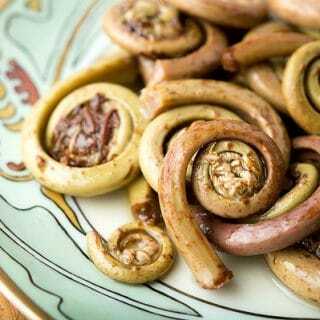 Trim the browned ends off each fiddlehead. Discard any that are mushy or crushed. Bring a large pot of water to a boil and salt it well. Boil the cleaned fiddleheads for 2 minutes, then plunge them into a bowl of ice water. Dissolve the 1/4 cup of salt in the quart of water. Fill a glass jar (I use a Mason quart jar) 3/4 of the way up with fiddleheads, which should be the whole pound. If not, use more jars and brine. Cover the fiddleheads with the brine by about an inch. Weigh them down. I use a narrow jelly jar set into the larger wide-mouth Mason jar, but a plastic bag filled with brine works well, as might a clean rock. Keep the jars in a cool, darkish place away from direct sunlight, which can rob the fiddleheads of their color. 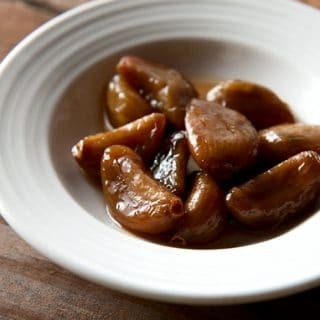 Let them ferment for at least a week, and up to 2 weeks. You might notice a little mold on the top of the brine: This is perfectly OK, just skim it off. When the fiddleheads taste crunchy and tangy, which I noticed after about 10 days, you are ready to store them. I fill pint jars with the spices -- split 50-50 -- and then repack them with fiddleheads. Pour over the brine from the original jars and screw on lids. Keep in the fridge indefinitely, although they will get tangier as time goes by. Fermentation time is up to you. The pickles should be ready after about 5 days, but they will get tangier as time passes. I put mine in the fridge after two weeks, which gave them a sourness like a kosher dill pickle. Once the pickles are in the refrigerator, they will continue to ferment, but very slowly. I've held similar pickles for a year and they were still good. You can find all sorts of recipes for pickling and preserving your harvest here on Hunter Angler Gardener Cook! Dont you kill the LABS with boiling? Sue: Not at all. The bacteria you want are in the air. You MUST boil fiddleheads, as they are toxic raw.